Jarroo-raa: "Y ddraig goch ddyry cychwyn"
"Leeidee y dragan jiarg y raad"
Ta Cayr Deeth (Bretnish: Caerdydd, Baarle: Cardiff) ny choontae, ny phreeu-valley as ny valley smoo ayns Bretin. Ta'n balley soit 'sy çhenn choontae Morgannwg ayns jiass ny çheerey. Rere staydraa yn choyrle valjagh, va ny smoo na 317,000 cummaltee ayn ayns 2007. T'ad gra dy vel bun yn ennym focklyn çheet er Castell ar y Taff, dy gra myr shen, "Cashtal er y Taff". ↑ Cardiff Timeline. Cardiffians. Feddynit er 2008-02-29. ↑ Beckett, J.V. (2005). City Status in the British Isles, 1830–2002. Ashgate Publishing Ltd, 2. ISBN 9780754650676. Feddynit er 2008-10-02. ↑ Cardiff. Ethnic Group (UV09). Office for National Statistics. Feddynit er 2011-09-24. ↑ Cardiff. Welsh Language Skills (UV84). Office for National Statistics. Feddynit er 2011-09-20. ↑ Hywel Wyn Owen (1998). 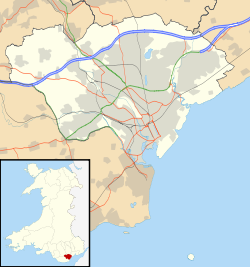 The Place-names of Wales. ISBN 0-7083-1458-9.